The PG Centre normally meets once a month from August to November and January to May. The meetings are informal and VISITORS ARE WELCOME. The Centre occasionally finds it necessary to change its meeting date, location or time. To verify the time and place of next meeting you can visit here. If no meeting is shown, there will be none that month. The interests of our members define the club’s astronomical activities. They include such things as: Evening Observing, Astronomy Workshops, CCD Astrophotography, 35mm Astrophotography, Observatory Tours, Solar Viewing, Supernovae Search, Telescope Making, Public Presentations, Astronomy Education, Near Earth Asteroid Observations, Astronomy Videos, Slide Shows, Software Development, Image Processing, Messier Object and Lunar Viewing Marathons, Variable Star Photometry, Meteor Detection Using Radio Waves and Cameras, Fund Raising, and Maintaining the Observatory. The Tabor Mountain Observatory as it appeared in 1984. 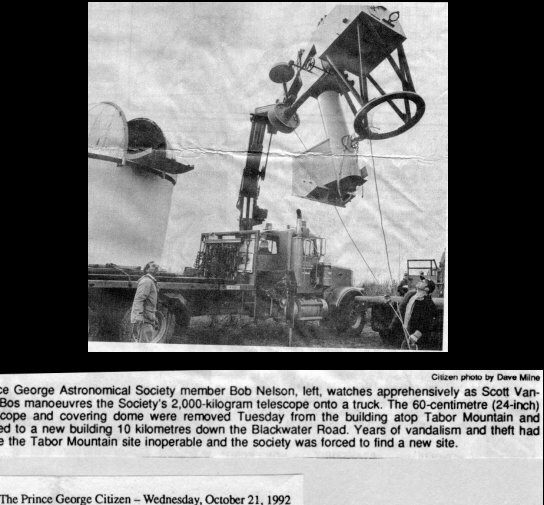 In 1979 the Prince George Astronomical Society (PGAS) was founded and the construction of the Tabor Mountain observatory was begun. The task took 5 years to complete by a team composed almost entirely of volunteers led by Bob Nelson. 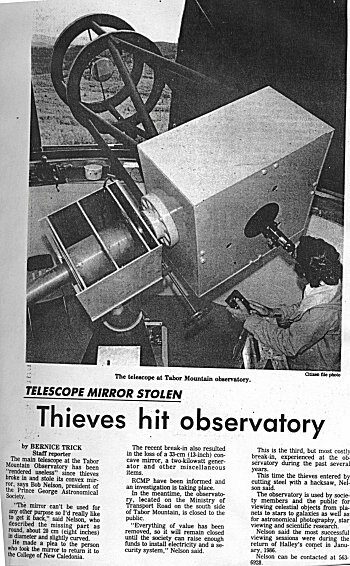 The Tabor Mountain Observatory opened to the public on September 22, 1984. The lenses and mirrors for the telescope were purchased while the telescope’s body and machinery were built in the College of New Caledonia’s millwright shops. The dome was constructed from an old farm silo roof. A slot was cut into it and a sliding door was fashioned to allow the telescope to see the heavens. CP air donated old aircraft bearings for turning the dome. If the Tabor Mountain Observatory was built by professionals it would have cost more than $200,000. Instead with the help from volunteers and donations of materials by local businesses and individuals it only cost $20,000. 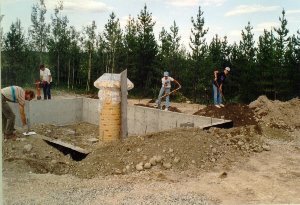 Construction of the new Observatory on July 1992. Construction of the Classroom on May 1993. In the summer of 1992, construction of a new observatory near West Lake began. 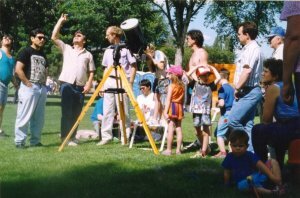 During the spring of 1993, the PGAS received funds from the Science Council of British Columbia to help with the completion of the Observatory. 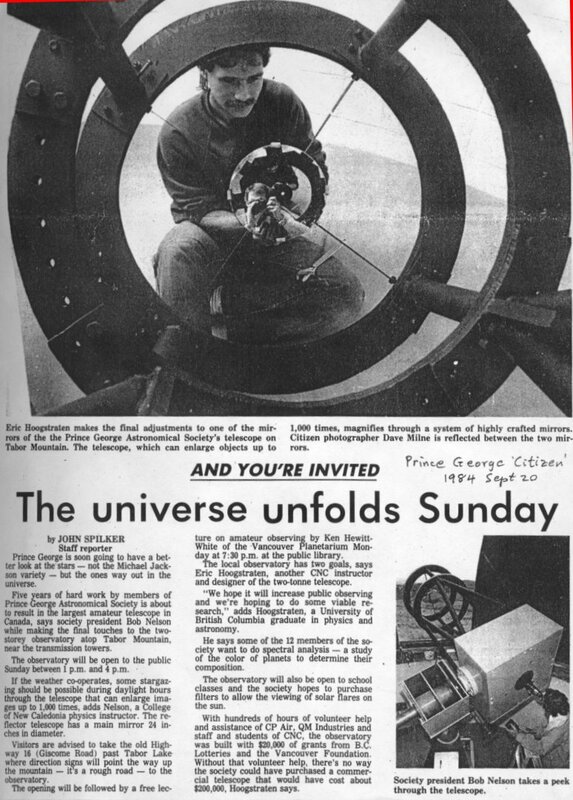 On August 6, 1993 the Prince George Astronomical Observatory (PGAO) was opened to the public. 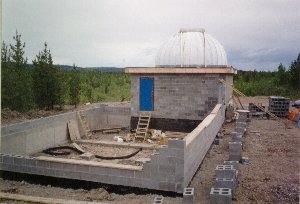 The new Prince George Astronomical Observatory on April 2004. Exhibition. The PG Centre now provides regular observatory access to the general public and special interest groups such as Cubs, Brownies and schools. We invite you to help with our continuing efforts and growth. 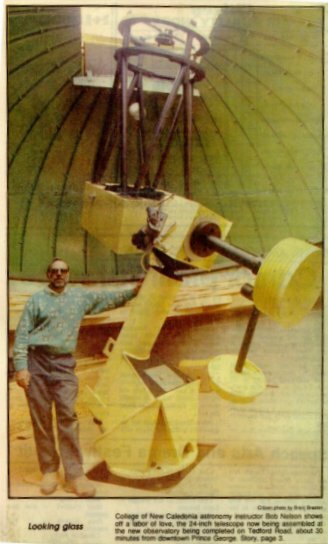 College of New Caledonia astronomy instructor Bob Nelson shows off his 2 ton labor of love. 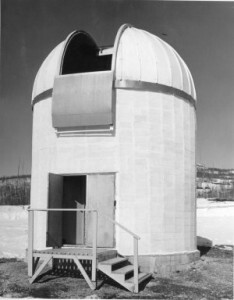 The Observatory houses a 0.61 meter Cassegrain telescope, one of the largest amateur telescopes in Canada. In addition, the observatory equipment includes several smaller telescopes, a modern CCD camera for astrophotography, several computers and lots of astronomy software, digital setting circles, an H-alpha filter and projection system for viewing the sun, laser pointer for pointing out constellations and interesting items in the sky, and a variety of eyepieces and filters to help visitors obtain the best possible view of the night sky. The observatory classroom can hold up to 45 visitors. Astronomical slides, video presentations, and demonstrations are part of our classroom activities.